The Non-I Protects the I is a three-person exhibition with the work of Joelle Dietrick, Meg Mitchell, and Judy Rushin. Taken from Gaston Bachelard’s The Poetics of Space, the title focuses on Bachelard’s ideas about the importance of shelter. All three artists consider shelter—Dietrick focuses on domestic space; Mitchell explores language as structure; and Rushin playfully reconfigures working class materials. With the housing crisis ever present in the minds of most Americans, these artists consider the importance of developing one’s own corner of the universe. Each proposed artwork reflects shifting attitudes towards necessity and finds grace in systems, even in moments of system failures. Joelle Dietrick’s temporary wall painting Sherwin’s Wall remixes fragmented foreclosed housing forms with commercial wall paint in color forecasts, suggested for better living. Reminiscent of both graffiti and objects accumulated in the video game Katamari Damacy, these shifting clusters reconnect Dietrick’s former muses, female expats, with her current repatriated state and the liminal state of the economy. Meg Mitchell’s installation Space is Language is Space builds frameworks for understanding semiotics and scientific data and subverts intellectual barriers through humor. 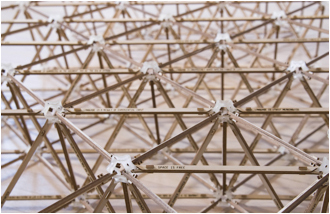 This piece combines text gleaned from a google search with a modular space frame. The nature of the google search creates an allegedly non-discriminatory body of data that is at times humorous, profound, self-referential and self-contradictory. Judy Rushin’s Carapace 1 creates a new wall from modular panels that are easily assembled and disassembled as an alternate perspective on the built environment and painting itself. Committed to repetitive work, like drilling, pouring, sanding, and measuring, Rushin embraces artmaking as an industrious job. All of the artworks offer new ways of perceiving what is essential in space construction. Realizing that past approaches are not sustainable, these artworks offer nonsensical, imaginative reconfigurations as refreshing reprieve from housing bubble fallout. In an age when perceived geniuses developed risky financial practices that led to the current economic crisis, these artists offer structures, with guts exposed, ready for a new and improved kind of logic.